COE premium for Category A (cars up to 1600cc and 130bhp) increased slightly from $25,920 to $26,170. Premium for Category B (cars above 1600cc or 130bhp) increased by 5.56% from $32,200 to $33,989. Premium for Category C (commercial vehicles) dropped slightly from $27,002 to $26,230. As for Category E (Open), premiums went up by 2.73% from $32,909 to $33,689. Premium continue to fall for Category D (motorcycles) which ended at $2,889, a whopping 19.97% dip from previous round. Car buying interest have been sparked up with the Singapore Motorshow as expected which led to an increase in COE prices from the first round of bidding in 2019. 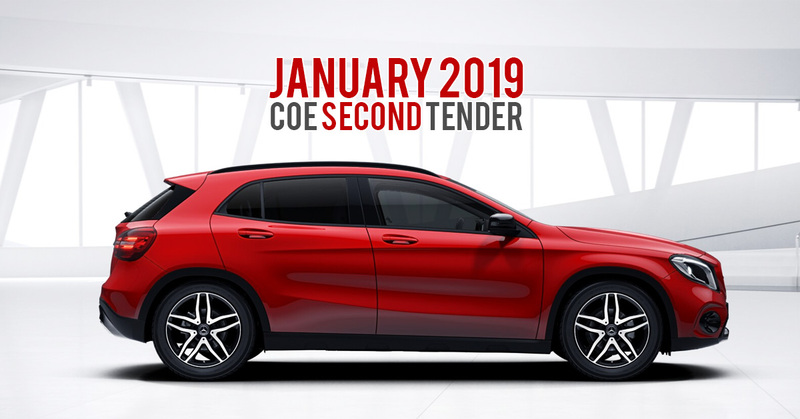 We predict that COE prices will continue to stay high after Chinese New Year as car dealers clear up backlog orders from the Motorshow. Furthermore, reports have shown that there will be fewer certificates of entitlement for upcoming three months. The quota for Category A cars will be reduced by 9.1% from 3,631 to 3,300 per month. Quota for Category B will shrink by 2.9% from 2,399 to 2,471 per month. The greatest drop will be for Open Category at 26.4% from 1,079 to 784 per month. Quota for commercial vehicles will also reduce by 25.2% from 2,207 to 1,651 per month. While the quota for motorcycles will reduce by 7.6% from 658 to 608 per month. In total, COE supply will be reduced by 12.9% as compared to November to January quota. This would imply that COE prices is likely to increase in upcoming rounds with smaller number of supply.